Arming Believers with the words of God's Book. Copyright © 2009-2017 Jeffrey W. Mardis & Sword-In-Hand Publishing. All rights reserved. Jeffrey W. Mardis has been a born-again Christian since April, 1979, and has been writing and researching on end-times Christian discernment issues since the late 1990s. 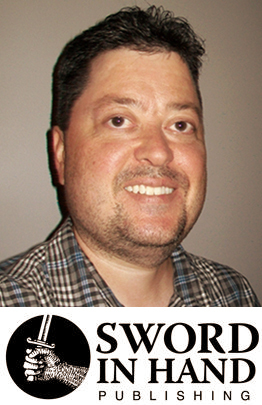 He is founder of Sword-In-Hand Publishing (2009) and a member of the Christian Small Publishers Association (CSPA). Sword-In-Hand Publishing was founded to provide an outlet to teach and edify others with the infinite store of wisdom and knowledge found in King James Bible. It’s purpose is to instill a deeper knowledge and love for the Lord Jesus Christ and love and appreciation for the Final Authority of the King James Bible. Jeffrey has served in the graphic design field since 1993. He is an award-winning and internationally recognized logo and trademark designer. His work has been showcased in numerous peer publications, as well as the prestigious Logolounge book series (2014 and 2015). Jeffrey has suffered with pain for nearly all his life as a result of an extrememly rare, and oft-debilitating, genetic bone disorder know as “Camurati-Engelmann Disease” (CED) or “Progressive Diaphyseal Dysplasia” (PDD). Due to this disorder, Jeffrey lost nearly 100% of his hearing in 2011, and acquired sever Tinnitus in the process. These infirmities have prevented him from public speaking or engaging in any radio or television interviews resulting from his publications. Jeffrey resides in Campbellsville, Kentucky and is a King James Bible-believing Baptist. I'm not serving the Lord Jesus Christ to earn eternal life. I'm not serving to keep Eternal Life. I'm serving the Lord Jesus Christ because I have Eternal Life. I have Eternal Life now, becuase of what He did for me. Christ shed His precious Blood for this ole, worthless, dirty dog. I believed it, and rejected my own selfrighteousness and it "saved a wretch like me". Amen and amen. Only one life will soon be past. Only what's done for Christ will last.